Lou Williams comes off the bench to score 33 points and dish out 10 assists in Los Angeles' Game 5 win over Golden State. Golden State takes Game 4 as Kevin Durant puts up 33 points and seven rebounds to beat Los Angeles. Kevin Durant erupts scoring 38 points on 14-23 shooting with seven assists, four rebounds, a steal and block to lead the Warriors over the Clippers, 132-105. Lou Williams comes off the bench to score 36 points and 11 assists in LA's comeback win over Golden State. Alex Caruso scores a career-high 32 points with 10 rebounds as the Lakers pull off the upset over the Clippers. CAREER NOTES: Has averaged 14.5 points on .419 FG and .369 3FG shooting in 285 games in five NBA seasons with Denver and New York . . . Selected to the Sophomores team in the 2010 T-Mobile Rookie Challenge at NBA All-Star weekend in Dallas . . . Participated in the 2010 Foot Locker Three-Point Contest at All-Star weekend in Dallas, finishing fourth . . . Joined the NBA after playing four pro seasons in Italy. 2012-13: Appeared in 71 games (all starts), averaging 16.2 points, 5.2 rebounds and 2.5 assists in 32.5 minutes . . . Led team with 135 3-pointers and also shot team-best .822 from the free-throw line . . . Scored 20+ points 22 times . . . Had 19 points, eight boards, four assists and three steals in 36 minutes vs. SAC on 3/23 . . . Had 23 points (7-11 FG, 5-6 3FG) and four assists in 36 minutes at SAC on 3/5 . . . Posted 26 points (4-9 3FG), five boards and five assists in 39 minutes vs. BOS on 2/19 . . . Recorded 18 points, 10 boards and three steals in 49 minutes at BOS on 2/10 . . . Had 27 points and career-high tying four blocks in 34 minutes vs. HOU on 1/30 . . . Posted 27 points in 38 minutes vs. IND on 1/28 . . . Recorded 25 points and four rebounds in 42 minutes vs. POR on 1/15 . . . Had 21 points, eight rebounds and six assists in 35 minutes vs. GSW on 1/13 . . . Posted 23 points (including game-clinching three) and seven boards in 31 minutes vs. CLE on 1/11 . . . Had 20 points and six boards in 32 minutes at LAL on 1/6 . . . Posted 26 points (7-11 FG, 11-12 FT) and five boards in 32 minutes vs. UTA on 1/5 . . . Scored a career-high 39 points (7-11 3FG) and grabbed eight boards in 34 minutes at DAL on 12/28 . . . Had 28 points and grabbed nine boards in 35 minutes vs. SAS on 12/18 . . . Had 24 points (4-5 3FG) and four rebounds in 35 minutes at MIN on 12/12 . . . Registered 21 points and nine boards in 38 minutes at NYK on 12/9 . . . Had 20 points and nine boards in 35 minutes at GSW on 11/29 . . . Posted 20 points and seven rebounds in 35 minutes vs. GSW on 11/23 . . . Had 26 points (10-11 FT) and five rebounds in 35 minutes at MEM on 11/19 . . . Had 21 points, seven boards and three steals and hit the go-ahead 3 in double OT in 48 minutes at GSW on 11/10 . . . Had 13 points and 10 boards in 41 minutes at HOU on 11/7 . . . Registered 23 points, eight boards and four assists in 35 minutes at ORL on 11/2 . . . Did not play on opening night at PHI on 10/31 due to left ankle sprain. Also missed two games due to sinus infection, two games due to left thigh bruise and six games with left ACL tear. 2011-12 (Denver): Appeared in 43 games (40 starts), averaging 14.6 points, 4.7 rebounds and a career high 2.7 . . . Totaled 20 points and five boards in 32 minutes vs. BOS on 3/17 . . . Posted 19 points, including a fall away three-pointer with 3.9 seconds to put the Nuggets ahead 105-104, vs. ATL on 3/13 . . . Tallied 20 points, five rebounds and three assists in 36 minutes at POR on 2/4 . . . Posted 21 points (5-5 3FG), six rebounds and four assists in 27 minutes at LAC on 2/2 . . . Posted 21 points and seven rebounds in 36 minutes vs. TOR on 1/27 . . . Had 23 points, five assists and three blocks in 35 minutes at SAC on 1/25 . . . Recorded a career-high 37 points and 11 rebounds while shooting 18-20 FT (both career-highs) in 52 minutes at NYK on 1/21 . . . Tallied 21 points, four rebounds and five assists in 35 minutes at WAS on 1/20 . . . Had 31 points to go with five boards, two assists and two steals in 40 minutes at SAS on 1/7 . . . Missed a total of 23 games due to injury . . . Left game vs. HOU on 2/6 with a left ankle sprain and missed next 13 games from 2/8-3/4 . . . Fractured thumb and missed 10 games from 3/21 through 4/7. 2010-11 (New York; Denver): Appeared in 62 games (60 starts) and averaged 15.6 ppg, 4.9 rpg, and 1.7 apg in 33.9 minutes . . . In 14 games with the Nuggets, averaged 14.7 ppg and 4.9 rpg in 30.9 minutes . . . Poured in 30 points (15-17 FT), nine rebounds and two assists in 42 minutes at Portland on 2/25 . . . His 17 FT attempts tied a career-high (2nd time) at Portland on 2/25 . . . Acquired from New York on 2/22 as a part of an 13-player trade involving Denver, New York and Minnesota . . . Appeared in 48 games (all starts) with the Knicks this season, averaging 15.9 ppg, 4.8 rpg and 1.7 apg in 34.8 mpg . . . Scored 20+ points 15 times and 30+ once this season as a Knick . . . Had two double-doubles on the year with New York . . . Missed a total of 16 games: two from 4/11-4/13 with a sprained right ankle, eight straight games from 2/28 to 3/16, and six straight from 1/4-1/14 due to a left knee sprain. 2009-10 (New York): Averaged 15.1 points (fourth on team), 4.9 rebounds and shot .423 (392-927) FG and .818 (251-307) FT over 33.9 minutes in 81 games (74 starts) . . . Season Highs: Points: 31 (4/6 vs. Boston); Assists: 8 (4/2 at Golden State); Rebounds: 11 (twice) . . . Played in team-high 81 games after back pain limited him to just 28 contests in rookie season . . . Shot 186-488 (.381) 3FG, finishing second in the NBA in makes behind only Houston's Aaron Brooks (209) and recording the second-highest single-season total in Knicks franchise history (John Starks made 217 in 1994-95) . . . Had 17 games with at least four 3FG makes, including five games with five, two games with six, one game with seven and one game with eight . . . Ranked sixth among NBA sophomores in scoring (15.1) . . . Led Knicks in scoring 12 times and rebounds four times . . . Had 20 20+ scoring games, two 30+ scoring efforts and five double-doubles . . . Scored 20+ points in a half five times during the season . . . Logged 40+ minutes 18 times . . . Poured in a career-high 31 points (10-15 FG) vs. Boston on 4/6 . . . Scored five points for the Sophomore squad in the 2010 T-Mobile Rookie Challenge at the NBA All-Star weekend in Dallas . . . Also finished fourth (tied) in Foot Locker Three-Point Contest and assisted on Nate Robinson's third career win in Sprite Slam Dunk competition . . . Tallied 30 points (8-16 3FG) in overtime loss vs. Philadelphia on 10/31, tying a Knicks single-game record with 16 3FG attempts while falling one 3FG make shy of tying the single-game record for makes . . . Only game missed was an injury-related DNP-CD due to a sore right forearm vs. Atlanta on 12/4. 2008-09 (New York): Lingering back pain limited rookie season to 28 games (two starts), averaging 6.1 points with .448 FG shooting over 14.7 minutes . . . Also shot 32-72 (.444) 3FG and 26-27 (.963) FT . . . Recorded six double-figure scoring games . . . Made at least one three-pointer in 21 of his 28 games . . . Scored a season-high 17 points vs. Atlanta on 3/4 . . . DNP-CD nine times . . . Missed 45 games due to back pain, including each of the last 16 games . . . Underwent successful back surgery on 4/7. Has appeared in 12 career playoff games (all with Denver), averaging 12.8 points, 4.4 rebounds and 2.3 assists 30.8 minutes per game. 2012 (Denver): Appeared in all seven games vs. L.A. Lakers, averaging 13.4 points, 5.1 rebounds and 2.4 assists in 31.7 minutes per game . . . Registered a career playoff-high 20 points to go with six rebounds in 35 minutes in GM 4 on 5/6 vs. LAL . . . Scored 13 points and grabbed a career playoff-high eight rebounds in 27 minutes in GM 2 at LAL . . . Posted 12 points, four rebounds and a career playoff-high seven assists in 28 minutes in GM 6 vs. LAL. 2011 (Denver): Started all five games, averaging 12.0 points, 3.4 rebounds and 2.0 assists in 29.6 minutes . . . Posted 18 points, four rebounds and two assists in 32 minutes in Game 1 on 4/17/11 at Oklahoma City . . . Recorded a career playoff-high with 37 minutes adding seven points, three rebounds and two steals in Game 2 on 4/20/11 in Oklahoma City. Participated in 2011 Eurobasket Championships for Italy, averaged 15.2 points and 6.4 rebounds in five games . . . 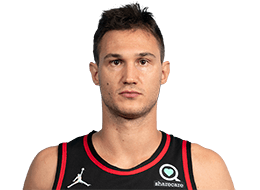 Appeared in 62 games (60 starts) in two seasons (2006-08) with Armani Jeans Milano of the Italian A-1 League, averaging 14.0 points on .452 FG and .363 3FG shooting . . . Was named Euroleague's Rising Star in 2007-08 . . . Scored a career-high 29 points vs. Siviglia during 2007-08 season . . . Participated in 2007 Italian All-Star Game . . . Signed with Armani Jeans Milano and played on loan with Edimes Pavia (Italian A-2 League) in 2005-06 . . . Member of Italian U-18 National Team, helping lead Italy to a bronze medal at 2005 U-18 European Championships in Belgrade while averaging 10.6 points . . . Made pro debut (at age 16) with Assigeco Casalpusterlengo of the Italian Serie B-1 League in 2004-05. Drafted by the New York Knicks in the first round (sixth overall) of the 2008 NBA Draft . . . Traded from New York to Denver along with Wilson Chandler, Raymond Felton, Timofey Mozgov, a 2012 second-round draft pick, a 2013 second-round draft pick, a 2014 first-round draft pick and cash considerations in exchange for Carmelo Anthony, Chauncey Billups, Anthony Carter, Renaldo Balkman and Shelden Williams; the Nuggets also received Kosta Koufos from Minnesota in exchange for a 2015 second-round draft pick (2/22/11) . . . Signed a contract extension with Denver on 1/25/12. Nicknamed "The Rooster" (Il Gallo) . . . Father, Vittorio, played professional basketball in Italy for a number of teams and was a Milan teammate and roommate of New York Knicks Head Coach Mike D'Antoni for eight years . . . Favorite athletes include Michael Jordan and Roger Federer . . . Wears No. 8 to commemorate his birthdate (8/8/88) . . . Threw out the first pitch at a Mets-Yankees game at Shea Stadium on 6/28/08 . . . Played for Italian National Team in the 2008 Summer Olympics qualifying tournament . . . Lists Michael Jordan, Larry Bird and Angelina Jolie as three individuals he'd most like to have dinner with . . . Favorites: actor: Denzel Washington; actress: Angelina Jolie; entertainer: Justin Timberlake; meal: sushi or gnocchi with gorgonzola cheese . . . Co-hosted 30 children to "Show Kids NY" with a day of fun-filled activities on 1/27/10 . . . Participated in the NBA's Basketball Without Borders goodwill tour to Senegal, Africa in August 2010.